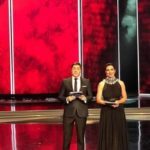 The Serbian national broadcaster, RTS, has announced the country’s national selection dates of Beovizija 2019. Beovizija was used a format to select the Serbian Eurovision act χρησιμοποιήθηκε, from 2003 until 2009 ( 2004, 2005 and 2006 for Serbia-Montenegro, while the rest years for Serbia). In the last edition of the Beovizija, Sanja Ilic & Balkanika won the national final and represented the country in Lisbon with their song Nova Deca, which came 19th in the final with a total of 113 points.